I am a musician! How can I increase my audience? Imagine that the long-awaited moment has come: your songs are recorded and mixed, and you decide to share them with potential listeners. As a result, the pages are already created in social media networks, your friends sign up for updates, listen, share and comment on your music. Thus, attracting the attention of other people and the chain starts. Sooner or later, you face the question: "How do I increase the number of listeners and followers?" What about the audio podcast? Do they can help you to promote your music? At least once in our live, we managed to listen to audio podcasts. Usually, we have an idea of what it is. 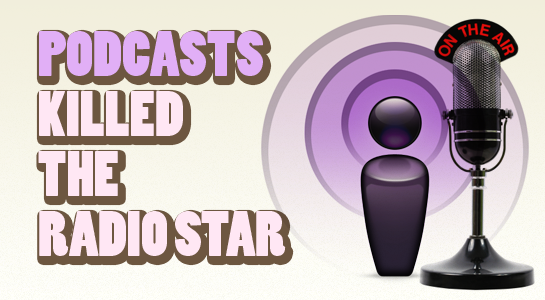 Let’s have a look at audio podcasts and why they help you to promote your music. 1. Become a big fish in a big pond. This is a great way to go beyond the boundaries of your city and the country. Podcasts are free and available to download easily from anywhere in the world. Subscribers to the podcast will have it automatically downloaded to their computer; therefore your songs will reach thousands of listeners worldwide. 2. Find your next biggest fan. The podcasts are designed for a specific target audience of 16-35 year olds, i.e. those most tech-savvy and likely to follow up on their new discoveries, which could be you. 3. By losing nothing, you get a lot. Don’t be afraid to put yourself out there! Submitting your music to the podcast is free and easy, and by doing so you have the chance to be heard the world over. 4. Join our community of friends. Create a community of like-minded musicians from around the world. Fans of the other bands on our podcast can easily become fans of your music, meaning your fan base will swell with new fans coming from our listenership. Being in music industry is like playing a game. In order to improve your skills, you need a coach. By having your music beamed directly into the homes of music fans everywhere you increase your chances of turning their attention to you and having something written about it on a wide variance of blogs and magazines. If you want to get your music heard by a worldwide audience, one of the best free promotional tools is our Podcast. Let us help you shape your future, faster.